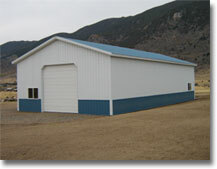 Check out our line of durable commercial steel buildings that can be used in many ways. Pole supported buildings work great for metal storage buildings and steel garages. With the speed and ease of post frame construction, commercial metal buildings can be constructed fast while keeping the budget in line. Our buildings work great for multi unit storage buildings. With poles typically spaced twelve feet apart or more, you can easily design a commercial building without the need for costly headers. Should you ever need to add on in the future it is also quick and cost effective to do so. 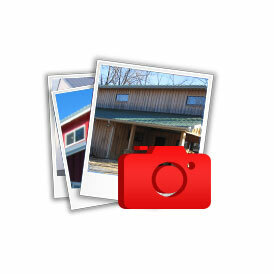 Using durable steel siding will protect those valueable goods locked safe inside. With lifetime warranties available, that steel roofing and siding will keep your metal storage building looking good for years to come. Hansen Buildings is your online source for custom designed commercial buildings quotes. 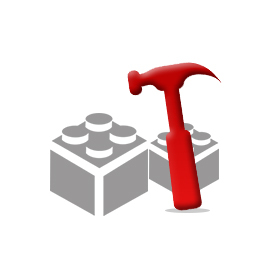 Looking to build that sturdy garage building? With minimum 2×6 wall girts and purlins your building is ready for heavy wind and snow loads. Our steel garages are all built with kiln dried framing lumber to prevent twisting and shrinkage after installation. Expect only the best quality materials on our metal garage buildings all the way down to powder coated screws. Top that off with optional commercial girts spaced 24 inches on center, not only adding strength, but allowing you to quickly insulate and drywall your steel garage. As you can see our buildings offer the quality and value you can trust. These are just a few uses for commercial steel buildings. We have had customers use them as homes, churches, fire stations, airplane hangars and more. The reality is a they can be used for just about anything. If you are in need of a metal storage building or steel garage don’t hesitate to request a quote and check out how affordable Hansen commercial metal buildings are. What Makes Our Commercial Buildings Better? We guarantee the lowest price commercial buildings for equal quality and features. 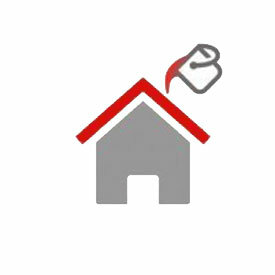 Got a steel garage quote at a lower price for the same building? Provide it to your designer and we will either match the price or requote a similar commercial building. Step by step instructions in a fully illustrated manual and stamped engineered plans included to guarantee your structural commercial building or steel garage permit. 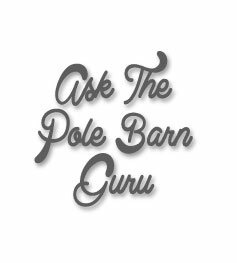 Unlimited pole building customizations – Change your design, style and colors as many times as you like until time of purchase. We want you to have the commercial steel building of your dreams that fits your budget. Your search for convenient, attractive and durable commercial buildings has ended. 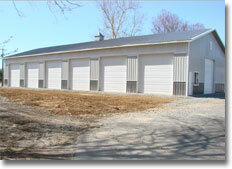 Welcome to Hansen Buildings – providers of metal storage buildings and metal garage buildings. 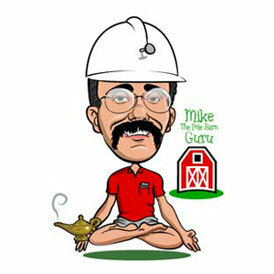 For the fastest building quote, click on FREE QUOTE to submit your pole building package needs. Or, call (866) 200-9657 toll free, 24 hours a day, seven days a week, to leave your information. Most quotes are completed in 24 to 48 hours.